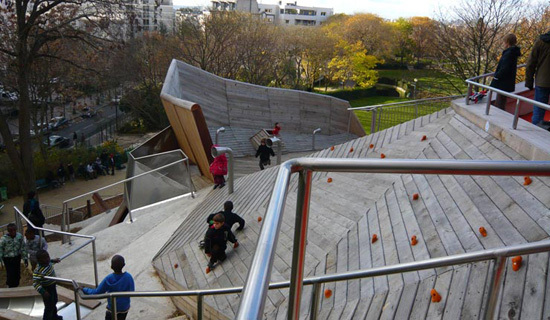 For those inured to the paranoia of modern-day (American) parenting, this playground, designed by BASE for Belleville Park in Paris' 20th arrondissement, must seem utterly baffling. 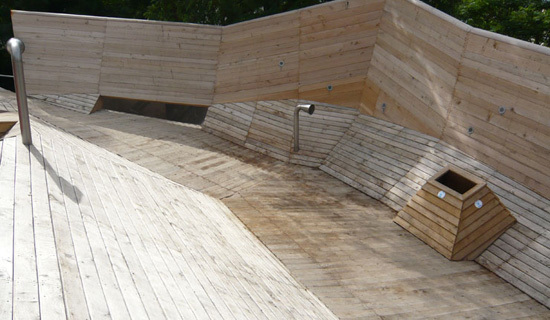 Where there should be springy rubber matting and wood chips, there's bare concrete. The timber pylons look to be no more than a forest of sharp edges and pointy corners awaiting an arm to fracture, a nose to bleed and a forehead to dent. Though not that steep, the climbing walls seem to be screaming to be equipped with ropes, harnesses and helmets. To our childless eyes, however, it looks like a proper playground, a neo-eugenics landscape in which society births strapping young citizens. Here, in simulated sieges of an abstract castle perched atop vertiginous cliff faces and fortified with obstructions, doughy, networked children are scarred into physical and mental fitness, into unlikely future burdens on the social health infrastructure of the country. 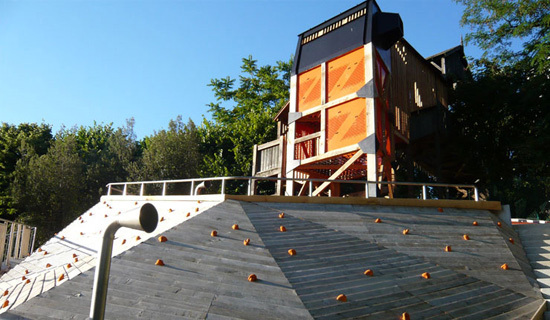 While this €1.1 million, high-end design playground isn't nearly anarchic and scruffy, nevertheless, it calls to mind Carl Theodor Sorensen's concept of the junk playground, renamed for England as adventure playground. 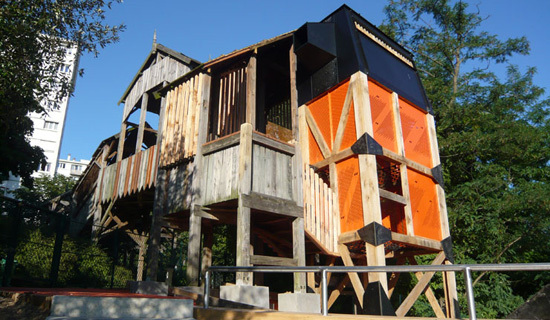 Mostly built on bombed-out sites during postwar reconstruction, these playgrounds consisted of “all sorts of old scrap that the children [...] could be allowed to work with, as the children in the countryside and in the suburbs already have. There could be branches and waste from tree polling and bushes, old cardboard boxes, planks and boards, 'dead' cars, old tyres and lots of other things, which would be a joy for healthy boys [and girls?] to use for something.” What children do with all the junk will depend on their imagination, initiative, their cooperation with other children and their autonomy from parental control. 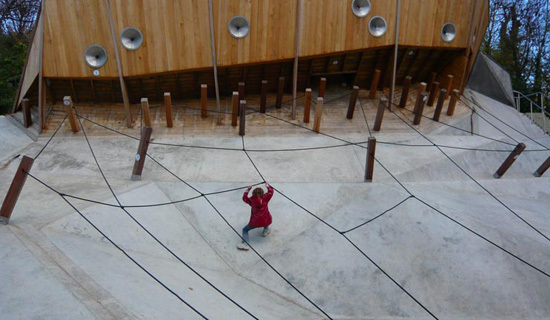 “The adventure playground,” wrote John Bertelsen, the first supervisor at the first such playground (1943), at the Emdrup housing estates in Copenhagen, “is an attempt to give the city child a substitute for the play and development potential it has lost as the city has become a place where there is no space for the child's imagination and play. Access to all building sites is forbidden to unauthorized persons, there are no trees where the children can climb and play Tarzan. The railway station grounds and the common, where they used to be able to fight great battles and have strange adventures, do not exist any more. No! It is now not easy to be a child in the city when you feel the urge to be a caveman or a bushman". 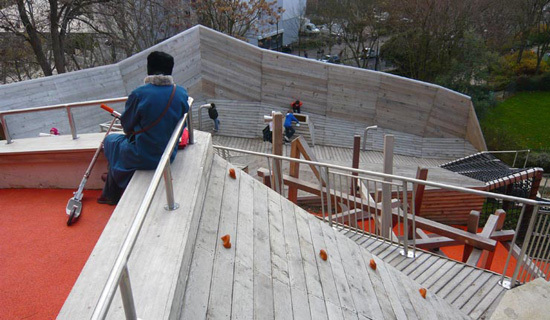 I was just thinking recently that there aren't many of the unique playgrounds -- often made of wood, metal, chains, and tires, with all kinds of semi-dangerous things to climb on -- I remember from childhood. Now so many are plastic and mass produced, more convenient and safe but not as interesting. This one is even better than the ones I remember from back then, and it doesn't even look dangerous. Great find! I thought that this would look fun to anyone, even me? But, alot of people on Current.com seem to think that somebody might get injured or something? I think it looks to be very inventive and I am a mother of 5. So, I know danger when I see it. Keep the babie away from it and maybe it will be fine. Im leaving two blocks further, never saw a so joyfull place than this one ... kids love it and parent love their kids loving it. Somehow it became the saturday meeting point for parents in this neighborhood. 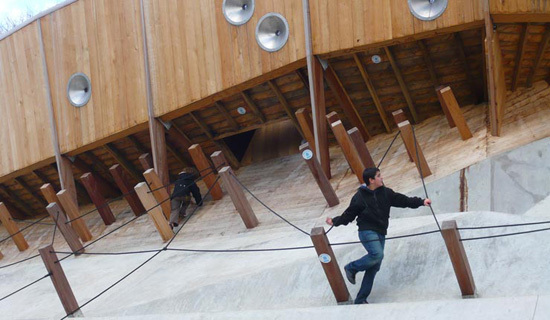 When I visited Valencia, Spain I was amazed at this gigantic figure of Gulliver turned into a playscape (Parque Gulliver). There were many "dangerous" things--jumping, swinging, sliding--that kids were doing with reckless abandon. I joined in because I was jealous and it was some of the best fun I had. it would be great without all the wood, try using more recycled plastics and other stuff, wasting trees for this is just idiotic. When I was a kid I used to go to this great place called the Crocky Trail based on Roald Dahl books. It was all set around this little river and had all kinds of wacky inventions - swings you had to pump to get going, giant logs over swamps, zip wires, bridges with false steps. Then suddenly, health and safety became a massive issue and the river had to be covered up with plastic matting! What's the point in going if there's no risk of falling in and getting wet? i agree on the playground design as it is now. build your safety instinct kids! just looking onto the shots got me envious i wanna be part of it! i miss my childhood days playing tough on anything i can grab on. 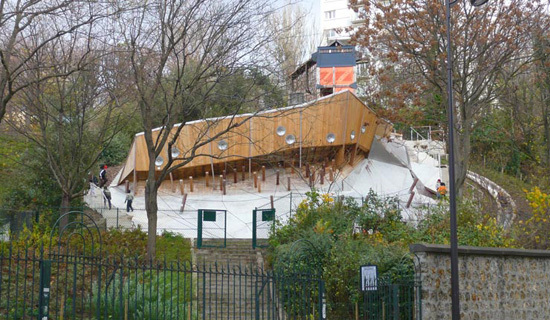 "it would be great without all the wood, try using more recycled plastics and other stuff, wasting trees for this is just idiotic." From an environmental standpoint it's actually better to use old growth timber for this purpose so that carbon is locked up in the structure, allowing the felled trees to be replaced by new growth forests that absorb carbon at a far greater rate. Plus it looks nice. 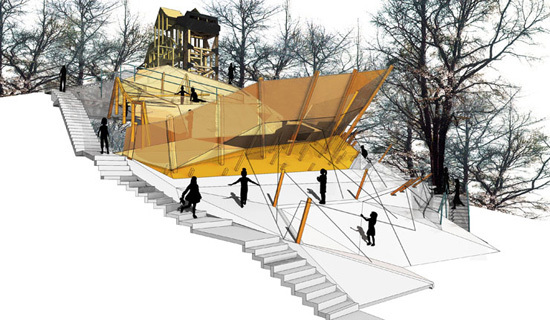 A playful playground for once. 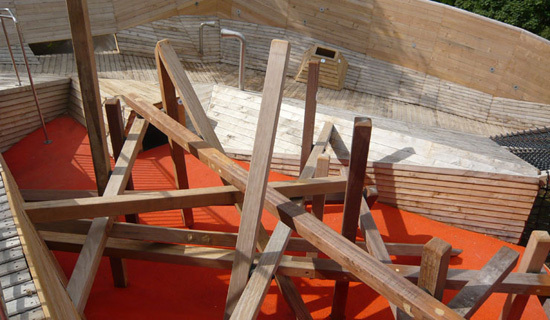 An interesting and exciting project that has the potential to show children the benefits of good design. Also, not at all accessible for any disabled child. Yes, I know I'm a wet blanket. But the "good old days" also had easy-to-choke-on toys, abundant lead paint, no seatbelts or car seats, and so forth - and we moved away from those for good reasons. In my mind, a little bland, boring, and predictable = totally worth it, if it saves precious little lives. Life is hard. They'll toughen up one way or another. No need to impale them on their playground equipment. "life is hard they'll toughen up one way or another. No need to impale them on their playground equipment." Or this could be a child's fondest memory of growing up.